The world continues to grow, people continue to innovate to make it easier, faster, and more secure. To live a better life and facilitate all human activities, from starting work, taking care of the house, to buying and selling transactions. From the start there is a Debit Card that facilitates transactions without cash, then there is a Credit Card. And now there is an E-Payment that is getting easier with just a Scan or Tab using a Smartphone. Many Startup Applications are also useful as a payment method. Being a payment tool that is easy and simple but still safe. You don't need to worry about having to carry cash, or having a loss or a broken card. Because now everyone always brings a Smartphone so that payments are easier and will not be a problem. Some E-Payment technologies continue to grow with the Barcode or Scan feature making the transaction process easier. Sending and receiving money using a Debit Card or Credit Card is still often experiencing errors or Denied, to overcome this you can use Scan Code or use E-Payment Balance. Electronic Payment or E-payment is an intermediary for payment transactions electrically or online. Where the buyer can make a payment, and if the seller does not deliver the product or product has not reached the buyer, the money will not be accepted by the seller. Many Online Stores or StartUp have started to use e-payment facilities as security for payment transactions on e-commerce. This can guarantee the buyer for the payment transaction. Where start up is an e-payment facility that is safe, fast and practical. The main purpose of E-Payment is to provide security to users, especially to buyers. Imagine if you bring millions of dollars in a bag, it can cause dangerous crimes. Different if you use E-Payment that provides security. 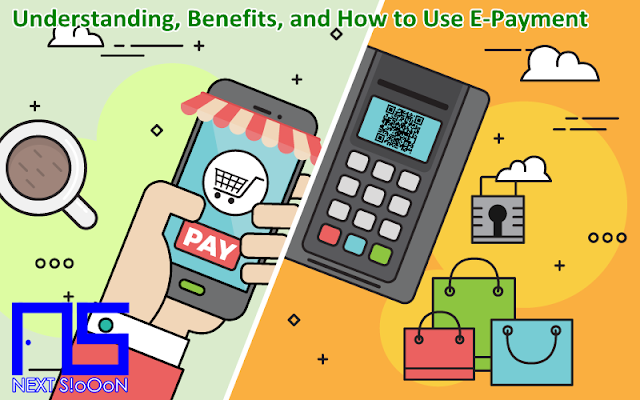 Some companies that provide E-Payment features will provide many facilities on very easy terms. It aims so that everyone can enjoy or use E-Payment, to use the E-Payment System you can simply make an account using Email by completing your personal data. Integrated with various Local Banks, making it easier to fill out balances or withdraw balances. Usually E-Payment provides facilities that can be installed on an Android Smartphone / Tablet, so it is more practical and can be used anywhere. Some developing countries in Europe or America, many sellers who provide E-Payment Facilities so that when buying can pay using Barcode Scan or use Secure Code. You don't need to carry an ATM card or cash because everything is on your Smartphone. Buying and selling transactions are getting easier and faster because of the E-Payment feature, you can search from various sites that provide E-Payment. That is information about E-Payment, hopefully it is useful. Thank you for visiting the Next-Siooon Website. The Next-Siooon website that discusses the latest Online Businesses, various accurate and relevant information. We try to provide information that is useful, legit, provides motivation and references so that we can all make money from the Internet. As well as providing information on the Legit Online Business site so that no one is harmed like being deceived. Keyword: Information and Benefits E-Payment, Information and Benefits E-Payment Information, Information and Benefits E-Payment Detail Info, Information and Benefits E-Payment Information, Information and Benefits E-Payment Tutorial, Information and Benefits E-Payment Start Guide, Complete Information and Benefits E-Payment Guide, Information and Benefits E-Payment Basic Guide, Basic Information About Information and Benefits E-Payment, About Information and Benefits E-Payment, Information and Benefits E-Payment for Beginners, Information and Benefits E-Payment's Information for Beginners Basics, Learning Information and Benefits E-Payment , Finding Out About Information and Benefits E-Payment, Blogs Discussing Information and Benefits E-Payment, Website Discussing Information and Benefits E-Payment, Next Siooon Blog discussing Information and Benefits E-Payment, Discussing Information and Benefits E-Payment's Details Complete the Latest Update, Website or Blog that discusses Information and Benefits E-Payment, Discussing Information and Benefits E-Payment's Site, Getting Information about Information and Benefits E-Payment at Next-Siooon, Getting Tutorials and Information and Benefits E-Payment's guide on the Next-Siooon site, www.next-siooon.com discusses Information and Benefits E-Payment, how is Information and Benefits E-Payment, Information and Benefits E-Payment's way at www.next-siooon.com, what is Information and Benefits E-Payment, Information and Benefits E-Payment's understanding, Information and Benefits E-Payment's explanation Details, discuss Information and Benefits E-Payment Details only at www .next-siooon.com information that is useful for beginners.